After the success of the night raid on the German strong-hold located on the Leipzig Salient the Lonsdales carried on in much the same vein as they had before. They moved to Senlis followed by Contay, Bouzincourt and then back to the Authuille Sector accommodating in billets along the way, involved in a variety of Battalion training and Brigade/Divisional exercises. In the early hours of the 24 June they took over from the 2nd Manchester Regiment and remained in the Authuille sector for the rest of the month. Before continuing with the actions of the Lonsdales in the summer campaign of 1916, a few paragraphs explaining the run up to the offensive provides a broader understanding of the events that were about to transpire. Stated after the fact in General Sir Douglas Haig’s despatch on 23 December 1916 the Allies had decided early on in the year that there would be a major offensive taking place during the summer months in a bid to push forward through a state of attrition that had seen little gains for some time. The despatch mentioned the offensive’s cooperation of the combined French and British forces where “neither army was sufficiently strong to take the offensive unaided,” which would suggest that what was being planned required a sizeable amount of manpower over and above that of previous battles since the war began. In addition to this the major German offensive at Verdun, which started on 21 February, was turning out to be one of the longest and bloodiest battles of the war. This had a direct affect on the strategy that would eventually become the “Big Push.” The French Commander in Chief, General Joffe, was putting pressure on his British counterpart for the withdrawal of French troops along the front to assist at Verdun. The French were under considerable strain from the might of the German forces there and desperately needed to strengthen their numbers if any successful conclusion was forthcoming from a battle that was tipped in favour of the German Empire. With the withdrawal of French troops along the front, the burden of the offensive would primarily fall on the shoulders of the British, taking a major role with sixteen of Haig’s divisions to Joffe’s five. For the offensive to have a chance at succeeding it was imperative the infrastructure and services to accommodate such a plan be put into action as quick a time as possible. 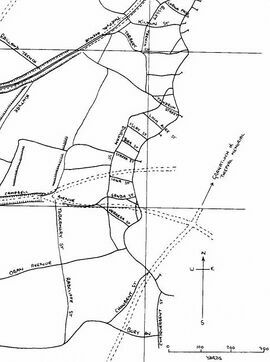 The proposed plan of attack along a twenty mile frontage was a formidable one. Two divisions of General Allenby’s 3rd Army were to carry out a subsidiary attack on both sides of the salient at Gommecourt, the idea of which was intended to draw German reserves to that area, while General Rawlinson’s 4th Army would make the main attack along the remaining frontage between Serre and Maricourt, a distance of approximately thirteen miles. The French 6th Army would continue the attack from Maricourt further south making up the additional mileage. The main attack was planned for the 28 June but inclement weather meant a postponement was necessary, the new date being set for 1 July. By that time the heavy bombardment and downpours had turned the once picturesque land into a barren, battered and unrecognisable version of it’s former self. The bombardment finally ceased, the weather was clear and warm and it was a perfect summer’s day to start one of the bloodiest battles in history. This briefly puts into perspective what happened prior to the summer offensive. The Battle of the Somme lasted until 17 November of that year. There were several other Battalions of the Border Regiment involved in that battle. During the first phase the 1st, 2nd, 7th, 8th and the 11th Battalion (Lonsdale) were all involved, of which the latter suffered terribly. The following account details their actions on that fateful first day. 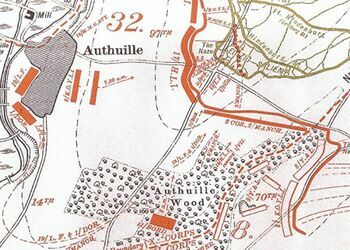 The Leipzig Salient, the commune of Authuille, the nearby Authuille Wood and the positions and directions of the units involved during the 1 July 1916 attack. The 32nd Division was assembled between Authuille Wood and Thiepval Wood at the base of the slopes of the Thiepval Spur. When the British shelling had started the guns located in the wood were standing wheel to wheel; an impressive sight to be seen. From the edge of the wood it was possible to see the Leipzig Redoubt, known as the Granatloch, as well as the proposed route along the valley and even as far as Mouquet Farm, the eastward route and destination the Lonsdales were detailed to make. Gun emplacements had prime targets in sight all across the stretch of the salient. The Lonsdales, Dorsets and Lancashire Fusiliers were the three regiments involved in the initial attack on the Leipzig Salient; however, it was the 17th Highland Light Infantry that were successful in taking the heavily fortified redoubt from the 1st Battalion 99 RIR, commanded by Major Baron von Merscheidt-Hullessem. On the 30 June at 10pm, after six days of shelling, the Lonsdales readied themselves from their dugouts at Crucifix Corner and moved to specifically dug assembly trenches in the thickest and least damaged area of Authuille Wood. Here, the men stayed for the remainder of the evening in relative comfort and safety. Lt-Col. Machell communicated to the officers commanding the Companies that "Zero time and Divisional time will be communicated to you later, and ample warning will be given, so let all rest until you receive message, and issue your orders, and special attention to be paid to absolute quiet throughout." Absolute quiet was essential as not to give anything away to enemy. Even the men themselves did not know the exact time the advance would start and so until fresh orders were given they stayed in their assembly trenches, ready to move out at any time, possibly writing letters to loved ones or trying to get some sleep before for the next orders arrived with instruction pertaining to their next movement. The 17th Highland Light Infantry, who spent their previous hours in huts at Bouzincourt, had already made their own preparations by taking reserve water supplies in petrol cans to the front line. On the same morning the Lonsdales were settled in Authuille Wood, the 17th Highland Light Infantry took up battle positions along Oban Avenue, a communication trench that led to the British front line from Authuille village. At 6.25 am on the 1 July the British bombardment once again started on the German front line. The task for the 97th Brigade, and indeed the Lonsdales, was to advance towards the German front line on the Leipzig Salient; to push through and capture Mouquet Farm (Mucky Farm as it was known by the British soldiers) where the German forward advance headquarters was located. The entirety of the British front line overlooking the Leipzig Salient was dominated by the 32nd Division, which comprised the 96th Brigade (on the left), 97th (on the right) and the 14th in support. The Lonsdales, on the right in the 97th Brigade, had to move out of the wood northwards and then swing due east almost ninety degrees, all this exactly to time after the other regiments in the 97th Brigade (which also consisted of the 16th and 17th Highland Light Infantry) had already moved out in a north-easterly direction before, too, turning east. The Lonsdales movement would bring them in rear of the Highlanders, who were already being targeted. The men would certainly be under heavy machine gun fire as soon as their cover was compromised from the safer positions in Authuille Wood. This fire not only came from opposite but also from enfilade fire situated in enemy trenches and machine gun nests to their right. They were still some distance behind the British front line. They had to cross their own open ground first, then into No Man’s Land before reaching the Highlanders as support. They knew the goals they had to achieve by the end of the first day. Lt-Col. Machell’s final instructions to the Officers Commanding Companies state: “All not hit must push on. Must do our job. If all goes well, I stay proper place; if goes badly, I come up and see it through.” But the situation did go badly and the attack did not go according to plan. Sketch map of the Leipzig Redoubt obtained by a group of Lonsdales from the successful 5 June night raid. Before moving on we should take a quick look at the actions of the other battalions along side the Lonsdales prior to their advance. Across the German frontage infantry and gunners may have been a little dazed from the barrage of British shells but they were, after all, well protected in their dugouts deep below ground. They left their dugouts and established their positions to find waves of British infantry walking steadily towards them. Fortunately, however, at the Leipzig Redoubt the barb wire had been adequately cut allowing their advance to continue immediately after the barrage had ceased. The German troops here did not have enough time to ready themselves effectively and were soon caught in a bitter encounter, which ended with the capture of the Redoubt and the establishment of a new partial British Front Line. The 17th Highland Light Infantry could not progress with any real success due to the overpowering fire coming from the artillery and machine gun fire from another German strong point called the Wundt-Werk. This position was the objective of the 16th Highland Light Infantry but the wire on their frontage had not been cut by the barrage. Unable to reach their objective they were shot down with heavy losses and almost no gain to show for it, the result of which had a knock-on effect. Small groups of the 16th Highlanders were able to join the 17th Highlanders and with support from the 2nd King’s Own Yorkshire Light Infantry they somehow managed to hold the Granatloch. The secretly dug ‘Sap’ (a concealed trench) protruding out from the German front line west of the quarry, was used to their advantage later that evening by surreptitiously increasing their numbers from the 2nd Manchesters. This helped to secure their gains up to that point. This was only possible because the sap, known as Sanda Sap, which had been dug beneath No Man’s Land, was now connected to the British front line. Reinforcements to the Granatloch would not get decimated by enfilade fire from the Wundt-Werk. This gain into German held territory was the most northerly ‘bite’ successfully taken on the 1 July. The British advance in other areas of the salient were not so successful. The German soldiers were going to defend their lines at any cost. As soon as they saw the British wave of soldiers advancing across No Man's Land they quickly found their targets and opened fire. It soon became apparent that the British bombardment on the German front line trenches in this, and many other areas, had not caused the damage it had intended. Many dug-outs remained in-tact and much of the barbed wire blocking any entrance to the enemy trenches also remained undamaged and impenetrable, as was the case with 16th Highland Light Infantry, who were situated to the left of their comrades of the 17th. It was impossible for them to cut their way through and the machine gun fire was far too damaging. The defences on the Leipzig Salient were extremely well protected. The Layout was a maze of trenches and dugouts all securely encompassed by barb wire and machine gun posts. It was here that Sgt. James Young Turnbull of the 17th Highlanders made his last stand against all odds to hold the line at what was considered to be a strategically important position. He, and a few others from his party, were overrun by the severe counter attacks. The entire party was wiped out. Turnbull was posthumously awarded the VC for his actions that day. 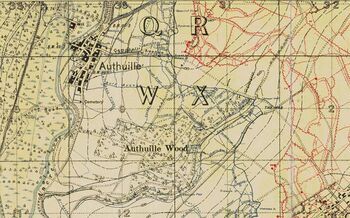 Original trenchmap of the Village of Authuille, the nearby Woods and the Leipzig Salient. 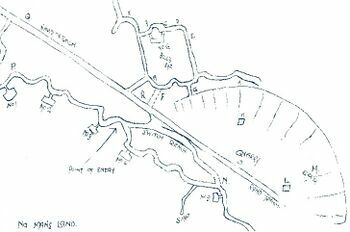 A simple sketch of the British trenches the area of Authuille showing the general direction of the Lonsdale's line of advance. Chowbent Street and Chequerbent Street can be seen at the bottom of the sketch. Lt-Col. Machell at Blackhall Camp in Carlisle during the Lonsdales training period before arriving in France. In continuing the actions for this day we should now return to the Lonsdales involvement. The men were by now expecting to be advancing across No Man’s Land along the entirety of the Leipzig Salient, yet this was not the case. Only the Leipzig Redoubt had been taken and that was at severe cost to the Highlanders. Generals could be very unsympathetic when there were goals to achieve. It was a slaughter to which they stood little chance of survival. Those who did make it to the front line waited for their numbers to join them. But many could not come as their bodies littered the open ground where they fell. Their commanding officer, Lt-Col. Machell, could see his men being cut to pieces. All those months of training at Blackhall Camp in Carlisle, the months already spent in France since November 1915, made the Lonsdales a close unit, a well-trained unit of fighting men with high regard for a man they would follow without hesitation. One can only imagine how he felt when confronted by this devastating sight before him. He rallied his men, at least what remained anyway, in the British front line trench putting himself at the head in preparation for a rousing speech before climbing the parapet. Sadly, Machell did not continue his advance as he, “gallantly leading his men, was shot dead almost immediately after leaving the forward trench.” It came to light that he was going to be promoted to command a Brigade the following week. Lieutenant Gordon and Major Diggle (who was second in command by this time) were both seriously wounded and the remaining men along with a number of Dorsets advanced across No Man’s Land. The Lonsdales at that point, amongst the chaos and confusion, we're now without any higher ranking officer to lead them. The following is an account of the moment Machell was killed, given in an interview to a reporter from a Lonsdale survivor who was by his side at the time. Although in the heat of the moment he believed his commanding officer was not dead, but injured, he carried on regardless without thought for his own injuries. But Lt-Col. Machell’s wound was fatal and his life, like countless others that day, and indeed during the war, was extinguished in the briefest of moments. A great commander and exceptional leader of men forever remembered in the hearts and minds of those that survived him, in the written words of his contemporaries, in various press appreciations and, of course, present day authors. At 8.45am the 1st Dorsets from the 14th Brigade also suffered heavy casualties having been hit by the same machine gun fire as the Lonsdales as they left the cover of the wood. The Dorsets war diary states that at “the end of Dumbarton track and the ground up to our front line trench was covered with our killed and wounded; yet the men continued to jump up and advance over their fallen comrades as the word to go was given.” The 19th Lancashire Fusiliers, who were taking the rear of the Dorsets, were held up by congested trenches and, for the time, remained where they were. The bodies of the Lonsdales and the 1st Dorsets were everywhere. The sight must have been horrific. Men who were friends had been cut down, many dying instantly, others slowly and painfully from unrecoverable wounds. Around 60 Dorsets and less than 50 Lancashire Fusiliers made it to the relative sanctuary of the redoubt. It was clear that the overwhelming force that had killed and wounded so many of the ‘pals’ from the advancing battalions was being orchestrated from the Nordwerk. At 1:45pm two platoons of the 2nd Manchesters made it to the redoubt. From early afternoon men from the 17th Highland Light Infantry, the Lonsdales, the 2nd King’s Own Yorkshire Light Infantry, the 1st Dorsets and the 19th Lancashire Fusiliers were clustered and fatigued in the German trenches at the Naze and were somewhat in a demoralised state by this time. This is hardly surprising as for six hours they had been progressively reduced in number under a constant, unforgiving stream of enemy action directed at their location. By 6pm 2nd Manchester reinforcements arrived and took over the redoubt but the fighting continued. The advance devastated the Lonsdales numbers. Of the 28 officers and 800 men that took part 25 officers and 490 men were killed, wounded or dying of wounds throughout course of the day. Popularised media and historical accounts tell us that men would have scrambled for shell holes to find whatever safety they could from machine gun and sniper fire. Their fate though would be sealed if a shell landed directly on them from above. The injured screamed in pain, those uninjured in fear of their lives probably did the same, which is understandable under such noise-filled, hellish circumstances. With no shade from the sun the heat during the hottest time of day would have been unbearable. Trapped and alone with little or no hope of being retrieved by your fellow comrades would prey on anyone’s mind. Water and food rations would have kept the stranded survivors alive for a few days and even taking supplies from the dead nearby would have prolonged the misery of being isolated amongst a desolate sea of shell holes. Those with serious injuries and without medical attention would have certainly died, many alone in agonising pain screaming for their friends. Some would have cried out for loved ones, their torment and peril oblivious to those back home in Blighty. A few Lonsdales managed to reach the Highlanders who had done well in reaching and taking the Leipzig Redoubt. But statistical information tells us over half the battalion strength was obliterated in a relatively short space of time. Many men lay motionless, dead. Those luckier were found by stretcher bearers who, in the cover of night, risked their lives each and every time to snipers whilst searching for survivors in No Man’s Land. Other survivors eventually crawled back to their own trenches where they, too, would have been moved to the nearby aid posts, seen by the medics. Those with little time left would have been visited by the padres giving last rites in an attempt to ease their mental suffering before the inevitable. The chaos of tending to the wounded, in cleaning and dressing wounds in preparation for being moved further back to the casualty clearing stations was an all too familiar sight along the length of the British front. And many Lonsdales became casualties for an unachieveable objective. Men could do no more. The table below provides basic statistical data for Lonsdale casualties on 1 July 1916. For a named list, see Lonsdale Battalion Casualties, 1 July 1916. The Hindenburg Line, which was roughly 150 yards further beyond the Leipzig Redoubt, had been reached by the 17th Highland Light Infantry later in the day but the force of fire from the Wundt-Werk eventually pushed them back. The Lonsdales and the four other battalions that had advanced on that area of the Leipzig Salient had been greatly reduced in number, thus, affecting the overall success and outcome of the events that took place. The bodies of dead and dying men were a similar sight at the redoubt too. The strategic foothold gained this day could not justify the terrible loss of life it took to reach and hold it. Many objectives for the first day of the Big Push were not completed or even came close to a successful outcome. The Lonsdale’s objective to take Mouquet Farm was an impossible task given that so many men were killed as soon as they left the cover of Authuille Wood. It would be another three months on the 26 September before Mouquet Farm was finally captured at a cost of many more lives. Yet, the capture of the redoubt ‘’was’’ considered a great success, and rightly so but not for the few yards of battered earth. Reaching the redoubt was on its own a feat of bravery let alone holding it in the face of an unforgiving, unrelenting enemy. But without the immediate and successful gains on either flank of the redoubt, holding such a position proved to be difficult. Several more attempts were made by the German infantry to take it back but they failed. Communication trenches were dug back to the British front line and the 32nd Division’s next objective was the 800 yard advance up to the Wundt-Werk. Of the 100,000 men who had advanced on the 1 July, a total of 57,470 had become casualties of which 19,240 were either killed or died of wounds. 35,493 were wounded, 2,152 were missing and 585 were taken prisoner. This was a costly price to pay for such meagre gains. For the Lonsdales who were cut down by machine gun fire their casualties by the end of the day were significantly high, as they were for the 1st Border Regiment, a little further north along the line at Beaumont Hamel, with a total of 575 casualties. All four battalions in the 97th Brigade suffered heavy casualties on the initial attack and the loss of life continued throughout the campaign. The British attack on the German front was much too slow and without doubt a costly advance. The German army also suffered heavy casualties throughout the Somme offensive and is to this day a much contested subject. The Lonsdales and Kitchener’s New Army had gained valuable experience but those who had survived the first day were to encounter many more hardships. The spirit of the Lonsdales was never the same after this fateful day, their emotional energy just as much a victim as the physical body with the multitudes of dead, dying and missing. Colin Bardgett aptly puts it “the idealism found in the men of Kitchener’s Army died on the Somme.” It had become one of the blackest days in military history. What had been captured on the 1 July by the Highland Light Infantry, and later with small groups of Lonsdales, was held throughout the 2nd but an advance was impossible because of the fire coming from other German strong points. On this day the battalion war diary simply states the “Battalion assisted in holding the line and found fatigues for carrying up grenades from Authuille Dump.” On the evening of 3 and 4 July the 32nd Division was relieved by the 25th Division. They withdrew from the battlefield and marched back to Contay Wood where they refitted and rested after their bitter confrontation three days earlier. The Lonsdales withdrew to dug-outs at Crucifix Corner then marched to Contay Wood on the evening of 4 July. The entire 11th Battalion had been reduced to just two companies in less than 72 hours. They were battered, bruised, demoralised and low-spirited. They should not have been ordered to leave Authuille Wood, especially when the Commanding Officer of the 32nd Division, General Rycroft, already knew the push forward from the 8th Division had not secured the damaging Nordwerk position to the right flank of the Lonsdales advance. But they were ordered to leave. They followed that order without fail and that led to the decimation of a battalion that had started the war with a very different outlook. What the future held for the Lonsdales was uncertain. After the severe losses on the very first day of the Battle of the Somme, the number of border casualties as a result of “obstinate generals” unsympathetic to the losses of a generation, was also uncertain. The Lonsdale Battalion was reorganised and both companies were commanded by Second-Lieutenants Ross and Welsh, respectively. Nothing of particular note happened to the Lonsdales over the next few days. 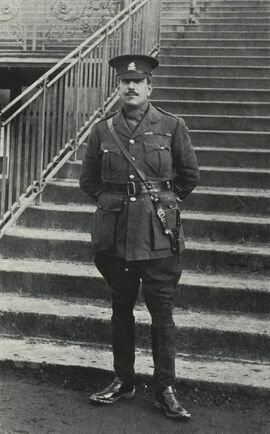 On the 15 July they were joined by Major A. C. Girdwood, DSO, of the Northumberland Fusiliers who was appointed commanding officer of the battalion. The Lonsdales would take no further part in this stage of the Somme offensive. However, their fight would continue. ↑ Referring to the small commune Senlis-le-Sec, approximately five miles east of Authuille, not the larger commune Senlis, 70 miles to the south. ↑ 3.0 3.1 3.2 Wylly 1925, p.78. ↑ 4.0 4.1 4.2 Bardgett, 1993 p.17. ↑ Hammerton, (no date) p.197. ↑ Hammerton, (no date) p.198. ↑ 9.0 9.1 Bardgett, 1993 p.18. ↑ 12.0 12.1 12.2 12.3 Wylly 1925, p.84. ↑ 14.0 14.1 Bardgett, 1993 p.19. ↑ 17.0 17.1 17.2 Bardgett, 1993 p.21. ↑ 20.0 20.1 Sutherland 1972 p.142. ↑ 23.0 23.1 Bardgett, 1993 p.29. J. A. Hammerton (No date). A Popular History of the Great War. Vol. III, The Allies at Bay: 1916. The Fleetway House, London. This page was last edited on 25 April 2017, at 18:06.